It seems to have passed through more hands than The Maltese Falcon. And it’s proving to be nearly as mysterious. Two pieces of iron armor — reportedly first found in the desert of West Texas about 150 years ago — have recently been analyzed by scientists in Nebraska, where the artifacts have been sitting for decades in museum storage. Archaeologists have been able to determine that some of the armor’s components are at least 200 years old, but details about who made it, who wore it, and where exactly it came from remain a total mystery. “I don’t know where this thing came from,” said Dr. Peter Bleed, a University of Nebraska archaeologist who led the study. Bleed supervised two anthropology students at the University of Nebraska — Lindsay Long and Jessica Long, who are now graduate students at other institutions — in their investigation of the armor as a research project. The Nebraska History Museum acquired the armor in 1990, consisting of a black helmet and a neck covering called a gorget, made of a cotton twill backing covered with small iron scales. But despite its storied past, the artifact — and the lore that came with it — had never been thoroughly studied. “I thought the armor itself deserved to be documented, in part because it had been in a private collection since the 1890s,” Bleed said. Bourke took the armor with him from post to post throughout the West during his career, losing the breast and backplates to thieves in Arizona along the way. But before his death in 1896, Bourke gave the helmet and gorget to a judge’s wife in Nebraska, and by the early 20th century, it was in the possession of an Omaha attorney, in whose family it remained until it was donated to a museum in 1961, and then to the state historical society. Historical records describe the equipment used by Spanish soldiers at that time, but the team found that it included little armor, the Spanish instead having used mostly padded leather or shirts of chain mail. “It just is not very much like armor known to have been used by colonial Spanish forces,” Bleed said of Bourke’s armor of iron scales. However, the possibility that Bourke’s armor was not Spanish didn’t mean that it may not still be very old. 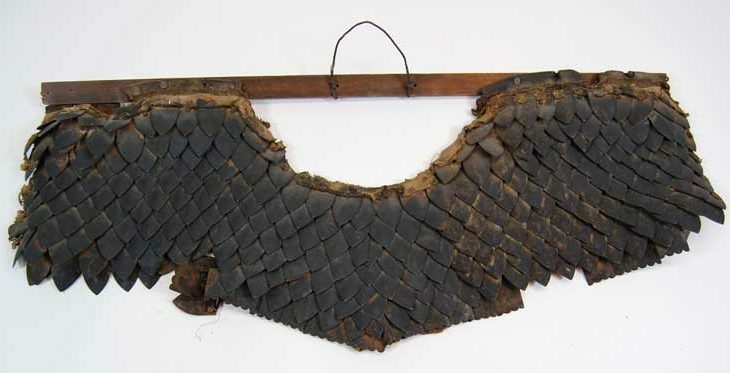 Radiocarbon dating of the cotton backing of the gorget showed that the fabric dated to between 1660 and 1950 — a broad range, but one that suggests that the armor could have been nearly 200 years old when Bourke received it. Still more clues were found at an even higher level of detail: in the microscopic structure of the iron scales themselves. The team submitted one of the gorget’s shield-shaped scales to the metallurgy lab at the University of Arizona. There, analysis revealed that the iron in the armor contained unusually high amount of slag — impurities like clay, quartz, and other non-metallic rock. This high slag content is the signature of an early smelting process known as bloomery, and it’s further evidence of the armor’s age, the team said. Bloomery was obsolete in the U.S. and Europe by the early 1800s, having been replaced by more refined smelting techniques. So the amount of bloomery iron being produced in the U.S. and Europe was “minuscule” by the middle of the nineteenth century, the team noted. “If the bloomery iron in the Bourke scale armor was imported from Europe, then at least the iron almost certainly arrived prior to the early 1800s,” they write in journal Plains Anthropologist, where they describe their findings. The researchers also considered another noteworthy material in the armor: the cotton. “I was surprised that there was a lot of cotton in the armor along with pre-blast furnace, or bloomery, iron in the armor,” Bleed said. “People tend to think of cotton as something that got big after the gin and that is often treated as a 1830s, 1840s development. “But by that time, bloomery iron was not being produced – at least in Europe and the U.S.
A few variables remain, he added, which could still explain the provenance of the armor. Little is known about manufacturing practices in Mexico in the early 1800s, for example, and whether bloomery iron became as scarce there as it did in the U.S. and Europe. “We know very little about industrial production in Mexico, so I suppose it might have been made in Mexico,” Bleed said. Another alternative, he posited, is that the Bourke armor wasn’t military armor at all. The use of iron scales like those in the Bourke gorget are not found in European armor after the 1400s, Bleed said. Nearly the only place they appear in 19th century material culture is in costumes, like those used in plays and operas, or as ritual dress for fraternal organizations, like the Freemasons. That, to Bleed, may be the most likely origin of the armor — although operas and fraternal organizations were presumably rare to non-existent in West Texas in the pre-1800s, when the iron seems to have been smelted. “I still think that it could be fraternal ritual costumery, but the iron seems too old,” he said. If nothing else, the researchers were able to determine that the Bourke armor was made centuries ago, and likely very far from where it was found. And this offers its own share of insights into how exotic goods moved around the Great Plains of the mid-19th century. “This is a complex and well-made item, the kind of artifact that shows frontier trade to be more complex than people might have suspected,” Bleed said. “Wherever it was made, I assume that it was traded to the Plains through the fur trade,” he added. “It shows that the frontier trade really was international and capable supplying a wide range of stuff. “If folks wanted armor, frontier traders would get it for them. Stole Texas from Mexico? You’ve got that wrong for sure. Remember that Texas was a Republican, won by blood spilled from men who fought Dictator Santa Anna. Some early Spanish expeditions into the Trans Pecos area of Texas such as that of Coronado had officers and probably some soldiers who wore armor. Before that, the Spanish found the Aztecs wearing quilted cotton armor so it wouldn’t be a big step from combining the coolness of cotton to the scale metal armor. All this is so well known that I’m surprised it wasn’t mentioned in the article. I having read many letters and testimonials about life in the west, it would not be unusual for a body not to be buried. Plains people put dead ones up on scaffolds. Could be the man found the body on ground after scaffold collapsed, the bones would have been picked clean by the time he discovered it. If they had a habit of picking up bones and putting them somewhere else they may have been all dead or pushed into new territory or the person was not a member of the people. The armor could have been remade by native peoples in Mexico by introduced cotton. Tests all count from where the test piece is located, DNA test would be interesting. Armor like that would have been quite a rich possession by native warriors. The scale armor you have found has also been found in New Mexico as well as by myself on the coast of Florida. Mine included weapons, buckles, aglets and Spanish Coins dating 1390-1402. A complete investigation on the Mexico scale armor has been done by Hugh C. Rogers and Donald J. LaRocca at the Metropolitan Museum, Arms and Armor Division and is PDF on line at “A NEW WORLD FIND OF EUROPEAN SACLE ARMOR” The armor dates to the period of the coins I found near mine. They also have a piece of the armor I found and is consistent with theirs. Good Luck. If it does date from the 17th or 18th century it might be a SECRET – an iron cap worn under a broad brimmed hat – which might explain the hole in the crown if the lining of the helmet were sewn to the crown of the hat it would serve as an air vent. Secrets were common in the English Civil War – they enabled riders to wear stylish hats with ostrich feathers or cockades instead of the more practical Lobster Tail helmets which were of Turkish Serbian and Polish Origin and much used in the Thirty Years War. 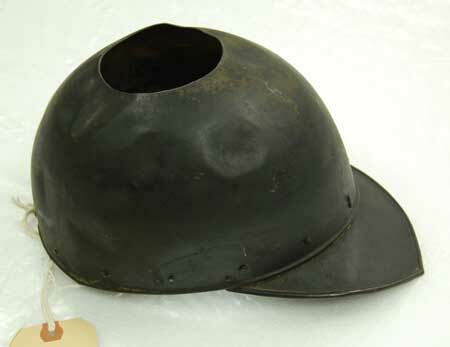 The fact that this helmet resembles a Jockey Cap might be an indication of its use as a Secret by a Spanish officer. I have seen a Peruvian 17th century painting of The Archangel Michael in which he is wearing an officers uniform of this period with a wide brimmed black cavalier hat not the Morion helmet and breastplate we think of as SPANISH Conquistador Armour. What is the mystery? We all know the Spanish were here well before the rest of the English and French in this area, they surely predate any 200 years plus, so what is the mystery, it is clear they were here and clear they went far into the North American Continent, what’s the question? E. Barton’s suggestion that the iron cap was a ‘Secret’ worn under a felt hat is a very good one, and best explains the hole in the crown. The visor piece may seem to contradict this, but it could have still been covered by a larger felt hat brim and be unseen, yet give the hat more protection. In its favor is the fact that it resembles the visors of buronet helmets used by the Spanish during the early colonial period. Contrary to the main article, scale armor was still very much in use at this time, particularly so in Eastern Europe. It is one of the easiest metal armors to make, and even if not the latest style, it could easily be a product of local Spanish manufacture, being easier to make yet provide a similar defense as the ring mail neck defenses still common in 16th and early 17th century European armors. Is this cave near Waco, Texas? The Spanish ventured into that region of west Texas – between the Rio Grande and Pecos – several times including the 1683-4 Mendoza – Lopez expedition which passed near Iraan, then San Angelo and to Menard before then returning to La Junta de los Rios; south of Ojinago / Presidio. It is perfectly possible that these are artifacts from this period. Why no comments about the Spanish armor found In a “cave” above Centerville Utah?